We understand the challenges of returning to work after a career break, because we’ve been there. Founder Katie Dunn started Back to Business to help women restart their careers and to help companies benefit from the amazing talent pool represented by women who are relaunching their careers. Back to Business believes that with the right skill updates, appropriate focus and an enthusiastic community of support, every woman can return to a fulfilling career. 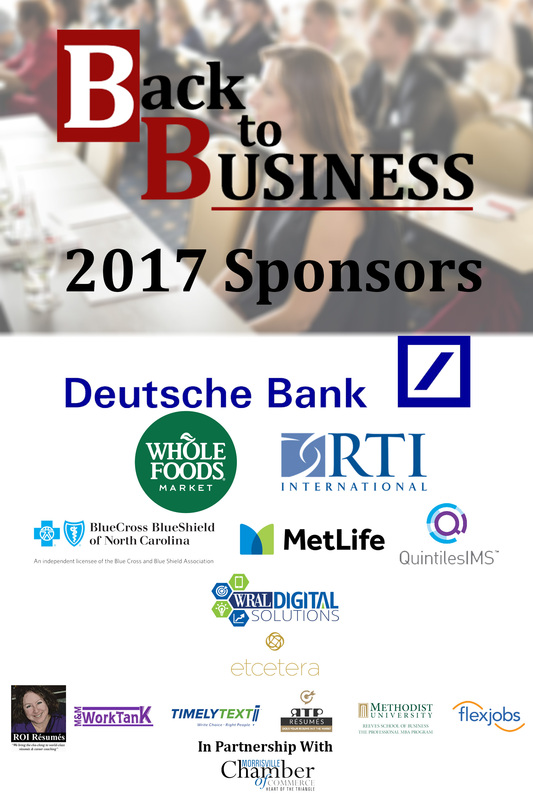 Our largest event each year is the Back to Business Women’s Conference, held in Research Triangle Park, NC in October. We bring together women who are interested in restarting their careers with resume experts, professional coaches and skill-building exercises that prepare them to execute a successful job search. The Conference concludes with a networking event with our corporate sponsors which gives conference attendees and recruiters interested in this high-potential talent pool the opportunity to meet and talk about available jobs. This is where the magic happens! Join our mailing list to receive notifications of Back to Business events. MeetUp: Excel Refresher Course – Monday, February 26th ($10 for lunch) SOLD OUT! Add yourself to the Wait List through the MeetUp if you’re interested so we’ll know if we should do it again. Registration opening soon – signup for the MeetUp and the Return to Work Insider to receive notice. Back to Business has resources to help you get back to work confidently and efficiently. From e-courses to local Workshops and MeetUps, to individual coaching and an annual conference, we help you every step of the way. Start with our free checklists and take the 10-day challenge to jump-start your search. Not sure where you fit back into the workforce? Try our e-Course “Charting Your Course Back to Work” to explore your strengths and passions. I would not have had the courage to do these things without your inspiration, Katie! So again, THANK YOU for taking the time to positively influence so many of us. The workshops and networking event help to channelize and provide step-by-step guidance. This is perfect to get my job search going as well as motivational. I’ve come away with action items, leads and insightful information. Katie is totally invested in our return to the workforce, and the women in this forum are very helpful, supportive and share information and leads with each other. I feel fortunate to be part of this group. I am not ready to begin my job search right now but I am using the next year or so to get prepared so I’m ready to hit the ground running. Katie’s workshops are spot on with getting me focused on each aspect of preparing to return to the work force. She always motivates me and I feel a great sense of direction and accomplishment after each workshop. Each year we work with a select group of sponsors who support our mission of providing a path back to the workforce for qualified women. Thank you to our current Back to Business Women’s Conference sponsors.